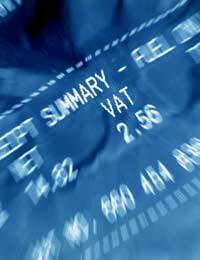 Preparing a VAT return is amongst the most dreaded tasks faced by any small business owner. There is a sense that dealing with your VAT liabilities is significantly more difficult, and more time consuming, than fulfilling your income or Corporation Tax obligations. While this may be true, with a bit of guidance and some forethought you can take some of the hassle out of completing your VAT return. There are a few key things to note about the VAT return. To begin with, you will have to complete one of these forms at the end of each VAT period. VAT periods can differ depending on the company’s financial arrangements, but you will generally be required to file a return every three months. You should also note that, if your annual turnover is less than £150,000, you can apply for the Flat Rate Scheme. Under this arrangement you can calculate your VAT liability as a percentage of your turnover. This is a simplified accounting method for firms with small turnovers; the remaining advice in this article applies to those who are not utilising the Flat Rate Scheme. From 1 April 2010, most VAT-Registered Businesses have to submit online VAT returns and pay electronically. And by April 2012, this will apply to all VAT-registered businesses. To submit online you will need a Government Gateway username. Your first step should be to apply for a username through the HMRC website. This comes by post and can take up to seven days to arrive, so don’t leave it until the last minute or you will miss the deadline. Once you are logged into the system, you can start filling out your return. As you can see, it is remarkably simple. Boxes 1 to 3 require you to enter the amount of VAT you have charged your customers. Boxes 4 and 5 ask for the amount of VAT you intend to reclaim from purchases. Boxes 6 and 7 ask for details of your sales during the period, and Boxes 8 and 9 refer to sales made to other EU countries. Theoretically speaking, the VAT return should take you no more than half an hour. However, this is only possible if you have kept proper records during the rest of your VAT period. If you do not already have one, you should seriously consider investing in accounting software that calculates your VAT on a transaction-by-transaction basis. These tools provide you with the figures you need to fill in your VAT return, at the push of a button. Finally, you should also keep a close eye on claimable expenditure that is not exclusively for business use. If you have any such expenditure (for example the purchase of computer equipment), you should keep careful records detailing the proportion of the expenditure that is business related. You may well be faced with an inspection at some point in the future, and it is vital that your records are in order in this event. VAT accounting is a regular hassle that many small business owners have to go through. However, with some efficient record keeping and a helping hand from some software, it need not be the end of the world. Hi, if I don't register will I get into trouble? In a year I prob make about £8000 it's more a hobby than a business.